Indian Railways’ (IR), Asia’s oldest, the world’s second largest under one management and the world’s fourth largest (after USA, Russia and China) under any form of management, second only to that of China. IR harbours about 8500 stations, runs nearly 21000 trains, serves around 2.3 crore passengers and transports 30 lakh tons of freight per day. Operations of the Indian Railways (IR) are overseen by Ministry of Railways (MoR), Government of India (GoI) and 16 Zonal Railways headed by General Managers. IR seeks to transform the design, functionality, operation and maintenance of railway stations to create modern, integrated, seamless transportation hubs and lively urban spaces. IR has entrusted Indian Railway Stations Development Corporation Limited (IRSDC), a deemed govt. company under its purview, with this mammoth task. Indian Railways is seeking to replace IRSDC’s current logo (participants may visit www.irsdc.com to see the current logo of IRSDC shown in the top-left corner of the 'Home' page) with a new logo and punchline. 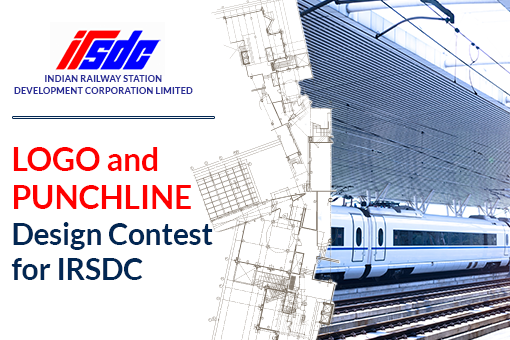 To be a leading organization in the field of development, redevelopment, operation and maintenance of railway stations with passenger amenities of international standards. To develop self-sustainable railway stations in the country with high standards of safety, comfort, user friendly passenger amenities, value added services and efficiency by adopting the best technological practices, sound financial strategy and optimum utilization of resources. 1. INR 75,000/- each for the winning entry in both the categories (viz., the logo design and the punchline creation) and Certificates of commendation. 2. Certificates of commendation for the other finalists.